Entering the scene in 2009, Klout is referred to as “the standard for influence,” measuring over 75 million online users and with more than 2000 companies making use of its data. It determines your clout (influence or power) on the Internet and outputs a score ranging from 1 to 100 based on an analysis of over 35 variables on various social media networks. Klout has invested in technology and science with engineers who are continually refining the measurement. Your Klout score is a visible indicator that represents your ability to not only grab the attention of your followers, but also to have an impact on them. Companies, recruiters and peers may judge your online authority and reputation based on this number. You can also use your Klout score as a benchmark to improve on your networking tactics. A 2010 Microsoft survey revealed that a stellar online reputation positively influences the hiring decisions of 85% of recruiting professionals. These recruiters would only need to glance at your Klout score to get a good idea of the relationship between you and your network. Currently, retweets, Facebook Likes and comments on content you share are all factored into the calculation of your score and Joe Fernandez says that by the end of the year, Klout will involve over 20 different social networks. Check out the “Amplification Probability” graph on your Score Analysis page to see what percentage of your content is acted upon and spread. “The ability to create content that compels others to respond and high-velocity content that spreads into networks beyond your own is a key component of influence,” Klout explains. 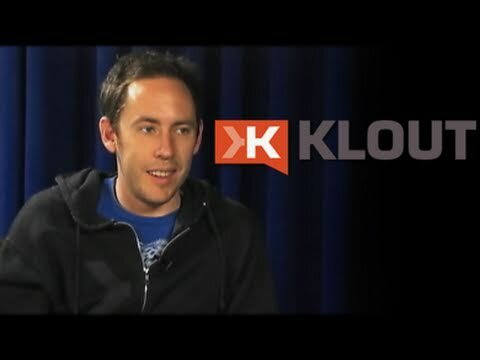 Just a month ago, Klout introduced the concept of +K. Klout uses an algorithm to determine which topics you’re an expert on. Others can give you a +K in those areas to manually express that they vouch for your expertise. A glance at your Klout profile shows the topics you’re influential about in a list of those that you’ve received the most +K’s on. If someone has been influential to you, consider giving the person a +K in the area. This kind of support is fundamental to deepening connections online. You have five +K to distribute every day and you’re able to give +K to the same person on the same topic every seven days. Use Klout to strategically grow your network. Building relationships with people who have high Klout scores means connecting with influential people who can introduce you to a wider network, and potentially promote you and your content to a highly responsive audience. These are the social media experts, self-proclaimed or not, who can teach you the tips and tricks of the trade. Search for the person’s Twitter username at the top-right section of the Klout website and scroll down to compare your statistics on Twitter and Facebook. Does the person have more retweets, Likes or comments? Analyze and learn from their social media interaction style and engage them in conversation on how they do it! Hootsuite, Seesmic and CoTweet are social media platforms that have incorporated Klout scores. You can also install a Google Chrome extension or Firefox Add-on to integrate Klout scores into the Twitter website. Tell us about your experience with Klout! Do you have any questions about Klout? This entry was posted in Careers and tagged grow network, klout, klout on twitter, networking, online influence, social networks. Bookmark the permalink. Post a comment or leave a trackback: Trackback URL. great piece on Klout, Samantha! I just started using Klout lately and was able to learn a lot from this article. Well done! I struggle to believe that Klout can give any type of accurate account of ones influence on others. His program only uses data it can draw from the internet (FB, Twitter and associated personal web sites). Since when does ones ability to be influential depend on their social status and followers. How will having Klout in the social media determine if I have true Clout in my workplace, in my community or with people I meet for the first time. I feel if people put to much weight into this type of Klout that they will develope a false since of who they are and will fall hard when they fail. Why can’t people develope who they can be and let their reputation and inovation to be the only Clout they need. I recieved the Failsnal when I took the Klout test. I didn’t have Twitter and not enought friends on FB for it to calculate a score. Concidering that 80% of all CEO of fortune 500 companies never attended collage and 70% of them don’t Twitter or FB. Where does Klout come up with viable influentual critira??? Great argument, Abe! In that sense, we should be more specific and say that Klout is really a measure of our influence online through social networks. One major criticism of Klout is that it currently only takes into account our influence on four social networks, which is why Joe Fernandez mentioned that they’ll have twenty social networks in place by the end of the year for a more detailed and accurate score. wow sam! you have way higher klout than i’ve got! way to go!